St Timothy was born in Lystra in Lyconia of a pagan Greek father and a Jewish mother named Eunice. His grandmother was a Christian and it was perhaps through her influence and teaching that he came to follow Christ. When the Apostle Paul visited Lystra, the young Timothy was already a full member of the Christian Church and after the two discussed the many difficulties Christianity was facing, the younger man expressed a desire to serve as a missionary, despite its hazards. It was after the departure of Barnabas and Mark that Paul summoned Timothy to accompany him as a colleague in the cause of Christ. About a quarter of a century after Christ, Timothy and Paul travelled to Europe, accompanied by Silas, in a missionary task of staggering proportion. In most areas theirs was at best a thankless job, but with the zeal born of a profound love of the Saviour, they succeeded in securing a foothold in spiritually darkened corners. They brought this about with administrative skill in the face of odds which might have discouraged less hardy souls. In a fury of religious oratory, they summoned thousands to the fold and established Churches of God where for centuries people had worshipped mere objects or beasts out of fear and superstition. When St Paul was summoned to Athens, he commissioned Timothy to carry the word of Christ to Corinth, Thessaloniki, and Phillipi. To these areas Timothy displayed his talents to the fullest in establishing a nucleus of Christian Churches which became the cornerstone from which Christianity has grown to its present day proportions. Timothy made his way to Ephesus were he was established as bishop of the city. A frenzied mob of resentful pagans whom he denounced stoned him to death. 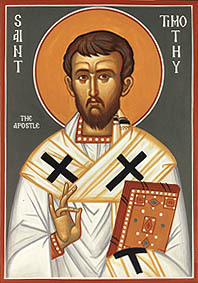 St Timothy died a martyr for Christ on January 22 AD 72. To the man Timothy fell the solemn honour of being the recipient of two letters from the great apostle St Paul entitled First Timothy and Second Timothy.